Do you only have limited space in your system for your Machine Vision components, however still require to powerfully illuminate your test objects? Then our miniature ring light LSR24 with its extremely compact and lightweight design is the ideal lighting solution for you. The LSR24 can directly be mounted onto the filter thread of the lens via a mounting ring. 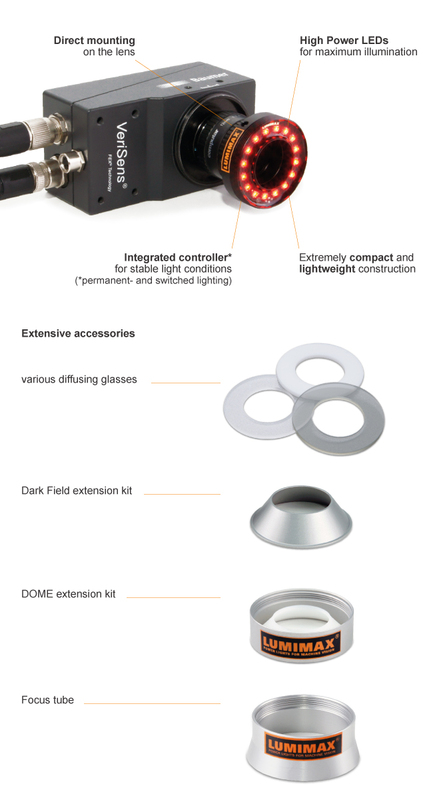 Thanks to an extensive range of accessories, such as dome- or dark field extension kits as well as various diffusing glasses, you receive the flexibility to adapt the light direction to suit your individual requirements. Do you have any questions or do you wish to receive an offer? Please reply to this email or call us at +49 (0)3681 / 455 29-0. Should you be no longer interested in our newsletter, please click here.